What can we learn from the multitude of ways in which ZERO is interpreted in this project? ZERO as emptied of purpose, people, presence, light, a process of de-signing, and the tactics deployed by urban dwellers to creatively overturn a perceived negativity into new opportunities. The spontaneous and contingent manner of the informal occupations of empty spaces echo the speed and unpredictability in which events and enterprises are created, sustained and erased in our contemporary world. The longevity of buildings can no longer guaranteed in the Great Recession and beyond, since ready capital for their maintenance can disappear as quickly as they appear. The 10 attitudes enable one to respond nimbly to situations on the ground, and to react swiftly to changes in social and economic boundaries. Such ephemeral, tactical acts take advantage of the temporal intervals to reclaim spaces momentarily for alternate uses and create new unintended potentials. The attitudes are not strict, limiting categories as many of the examples share more than one attitude within a specific location. Moreover, in high dense Asian cities, the large population of people and constant human traffic afford a degree of invisibility to urban dwellers and support activities that may otherwise be curtailed in a less dense environment. "What needs to be happen is a change in the peculiar institutions of affluent city life, in order to create new forms of complexity and new forms of diverse experience" (3). 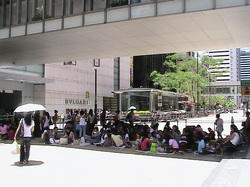 The examples present a different form of life in cities, where their continuing existences depend on a myriad set of conditions that are socially, materially and spatially contingent; a form of complexity that the urban dwellers need to acknowledge and reconcile but are absent for someone living in an affluent society. 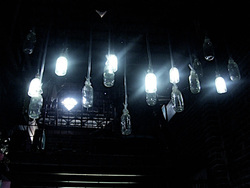 Even for the re-appropriation of empty bottles as light fixtures as shown in one of the examples, the process entails dialogues, negotiations and an acceptance from the community. In a fascinating way, the research also reveals that one can actually survive and fulfill most of one’s needs in these empty sites without designing a new building. Perhaps it is an extreme case of urban survival. 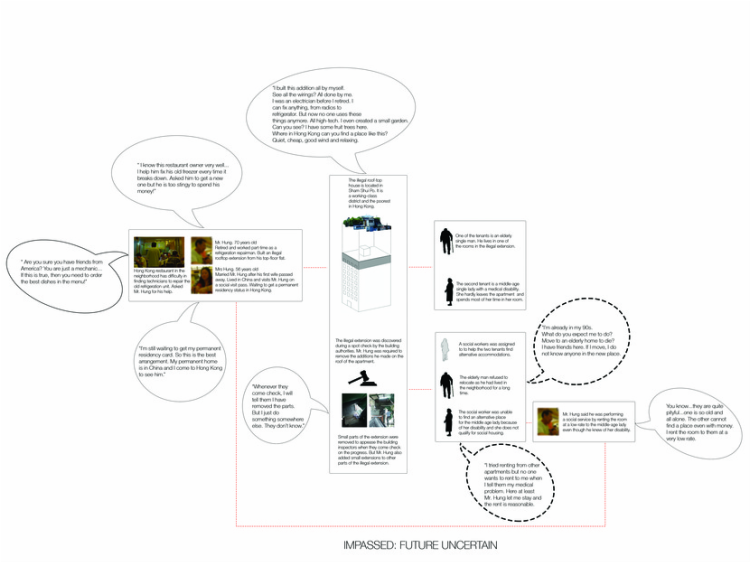 However, the examples still offer a chance for architects to re-evaluate the role of architecture and how they can re-configure the relationship of buildings, people and spaces in a post economic bubble age. 1. Patel, Raj. (2010). The Value of Nothing: How to Reshape Market Society and Redefine Democracy. New York: Picador. 2. Sennett, Richard. (1970). The Uses of Disorder. Personal Identity and City Life. (pp 81-82). New York: Alfred A. Knopf. Micro is not only beautiful but vital for survival in an age of speed, uncertainty and dwindling resources. As far back as 1973, economist E.F. Schumacher (4) espoused the virtues of smallness in response to the oil crisis. At the local level, thinking and acting small offers greater agility and responsiveness to change. Being micro enables one to occupy the tiniest of empty spaces in the city to start a business. 4. Schumacher, EF. (1989). Small is Beautiful: Economics as if People Mattered. New York: Harper Perennial. 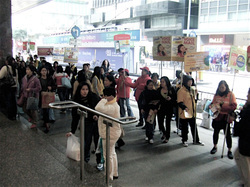 The SIM card vendor in Bangkok exists as a low impact and capital outlay form of micro businessperson. By being small, she is able to respond rapidly to any changes to her customer base and is not weighed down by inventory. Being singular, she is also highly mobile and can shift her base of operation from one tiny unoccupied space to another. 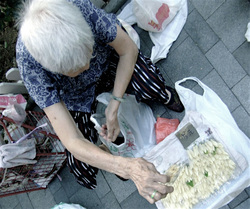 The elderly selling scented flowers to passers-by along a sliver of empty space next to a busy sidewalk operates alone. The micro trade supplements her small income from the government, and allows her to lead an active life and be independent. 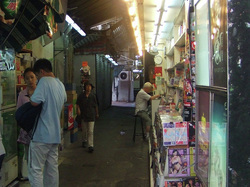 Less than 2 meters deep shops line the sides of empty back lanes in Hong Kong offering a variety of services and products for sale. 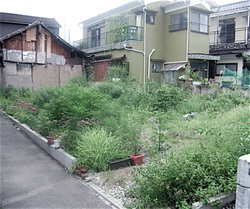 Local residents in Beppu reclaimed empty sites in the city to form micro gardens. The gardens give the elderly an opportunity to socialize and be active. Small gardens are also easy to maintain collectively in the long run. 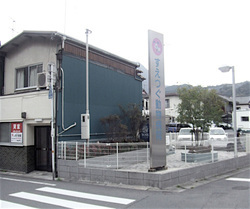 The small park (for dogs) and free for all residents to use replaces an empty site in Beppu. The park is sponsored and maintained by the pet hospital across the street. By offering a space for the locals and their pets to spend time, the pet hospital provides a service to the community, which in turns increases its popularity and business from the local residents. To be tactical is to not possess ground but to act swiftly, in a nimble and sparingly manner to reclaim empty spaces for alternative uses or to exploit an untapped resource. The tactical foraging for free and used cardboards and papers by an informal collector from the official bins of a large recycling company reveals an intelligent, resourceful tactic whereby the underdog, in this case the collector can overturn the advantage of a large corporation to his own advantage. The green color bins make it easy for him to find waste cardboards and papers now as they are centralized in one location. 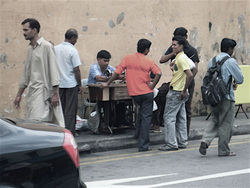 The sidewalk tailor tactically takes advantage of an empty public sidewalk to set up a tailoring stall to serve migrant workers in Singapore’s Little India. Although denied of proper and formal opportunities because of his temporary status in the city, the migrant worker is able to take advantage of his invisibility among the thousands of other migrant workers to ply his informal business. To deploy is to engage in an informed act of responsive distribution and arrangement to attain a specific outcome. Deployment accepts the ephemeral character of contemporary life and the letting go of our cherished idea of a lasting and permanence presence. 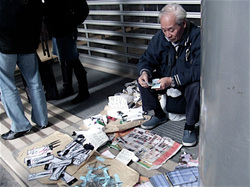 A street cobbler deploys his stall along an empty flight of steps leading to a local shopping center. 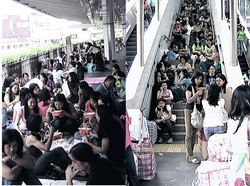 The stall takes advantage of the passing pedestrians and those entering the center. 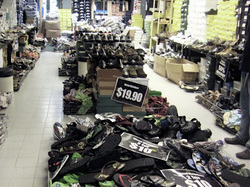 At the end of the workday, the portability and compactness of the cobbler’s stall enables it to be stored for the night either within a vacant floor of the shopping center or along the empty back alley. 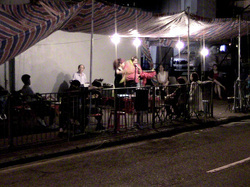 The Da Siu Yan stall is located in an empty corner of a pedestrian island beneath a highway. It deploys a series of empty stools along the perimeter to expand the loose, permeable work boundary. 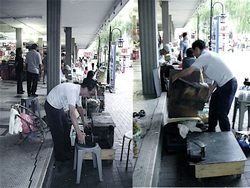 The stools also invite potential customers to come sit down and negotiate the price for the service. Once sat, the chance of the customer agreeing to the service is higher. 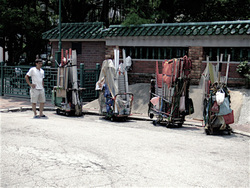 The night market stalls are portable and ready to be deployed in the evening along a empty street. The compactness and scale of the stall makes them deployable in a rapid fashion, as opposed to a conventional shop that is burdened by contracts and regulations, and fixates its locality that limits its flexibility. Making do is a highly ingenious, simple act that combines making, which is creative and doing, which emphasizes action. By making something from almost nothing, making do is a sociable process of adaptation to and improvisation with materials, objects and spaces. 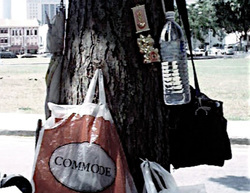 In the absence of proper storage, a group of informal recycling agents adapted their needs from an existing tree that also offered shade to their collection site. Along the trunk of the tree are secured a few belongings of the agents. Perforations in a fence allow a group of gardeners to hang personal belongings while working outdoors. 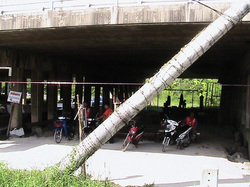 A group of residents adapted the existing concrete beams and the empty underside of the concrete slab to hang the bamboo poles for laundry drying. 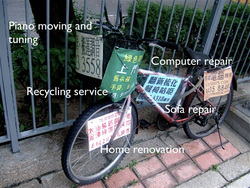 An abandoned bicycle, emptied of its original usefulness is transformed into a place to advertise for one’s business. There are a total of 5 services advertised: Piano moving and tuning, computer repair, recycling, sofa repair and home repair. 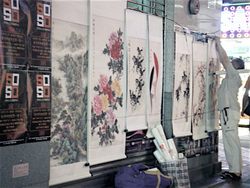 A local street vendor adapted the metal grilles of a bank, which is closed in the evening to display art works for sale. 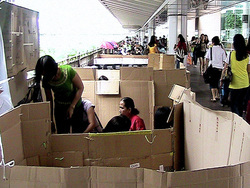 Filipino migrant workers creatively transformed used and empty cardboard boxes into private rooms for sleeping and socializing. The height of the cardboard rooms also effectively shielded them from the gazes of passers-by. Adapting and recycling empty glass bottles as ceiling lights for a small library by CASE Architects in Bangkok. 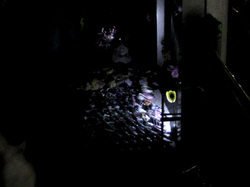 A unique feature in Bangkok are the flashlight markets that make up for the absence of light by using flashlights. Customers also come equipped with their own. Perhaps a new aesthetic of darkness? Create and sustain interdependent social and economic ecologies of mutual benefits. The days when a building exits as a self-contained, aesthetic object independent of its context is no longer environmentally or socially sustainable in a age of limited resources and economic stagnation. 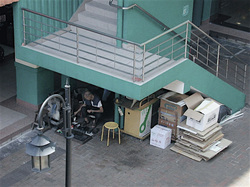 In the informal recycling network in downtown Singapore, the used cardboard and paper are obtained by foraging from the recycling bins and from the office workers nearby. 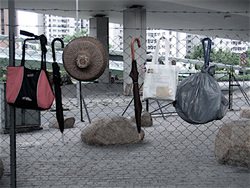 The collection points set up in empty carparks and back alleys of houses collect them and also double up as social spaces for the local residents. The collections are brought to factories where they are sorted and compacted, before shipping off to Batam, in Indonesia for recycling into new cardboards. There is no contractual arrangement between the local factories and the informal recycling agents. The factories enjoy a wide supply and are more responsive to fluctuating economic situations. 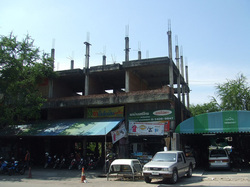 A simple ecology of activities in the Min Buri district of Bangkok has risen due to the presence of the big box retail store Tesco. 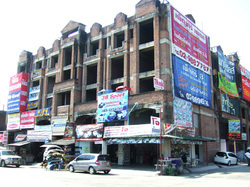 The need for cheap transportation to and from the store activated the motorcycle taxi service, which resulted in a series of corresponding demands such as car and motorcycle repair shops, affordable eating and sleeping places to be set up in the adjacent abandoned residential development. Other businesses soon followed and the empty development has evolved into a vibrant and symbiotic relationship with Tesco. Contingency recognizes the unpredictability of events and its dependency on external conditions. Negotiation and adjustment are necessary for continuous existence. One of the features of old walk-up apartments in Kowloon is the extension of living spaces on the empty rooftops. 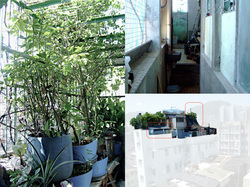 The form and extent of the rooftop homes can range from modest additions to very elaborate ones that include fruit gardens and two story living spaces. Besides residential, other uses include restaurants and cafes. 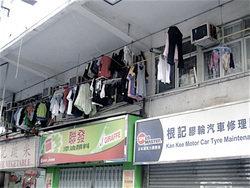 The extensions are illegal and are subjected to demolition by the authorities. Many of the rooftop additions house tenants who either do not qualify for public housing assistance or find the rentals for regular apartment beyond their means. Without these alternative living spaces, many would be homeless. 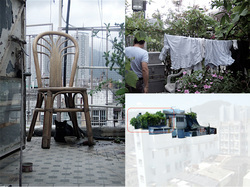 A Hong Kong resident acted in a contingent manner and built a two story extension above the roof terrace. He rented a room out to a ninety year old man and another to a middle age lady with disability. He was ordered by the judge to remove the extension but argued that his two tenants have no where to go. The social workers were called in to help, and this has been an ongoing case. Meanwhile he would unbuilt parts to the house when building inspectors came to inspect. This has been going on for many years and the unknown future allows him to continue living in his two story extension. To share is an offering and implies an equitable enjoyment of something either collectively or by turns. Sharing is against our animal survivor instinct, which serves to protect and preserve one’s interest and existence. However, in an age of depleting resources and environment degradation, sharing offers us hope for a more caring and fairer relationship between us and the landscape we inhabit. Sharing also acknowledges that public spaces are resources to be shared and enjoyed. Located along the sidewalk of a quiet, empty street in the northern part of Singapore is a rare, and perhaps the only multi-religion temple in the city-state and the world. It is rumored that the temple initially began as a ‘dumping ground’ for porcelain religious deities and as a place for long haul truckers to ask for blessings before making their journeys up to Malaysia. 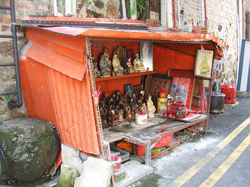 Gradually, the assortment of religious shrines and paraphernalia, ranging from Chinese to Malay, Indian and Catholic grew and they were carefully placed in different sections along the raised sidewalk. Despite the informal nature of the temple, it was observed that devotees coming to the temple took off their shoes before stepping onto the sidewalk as a sign of respect for the sacredness of the place. Currently, a caretaker looks after the temple on a voluntary basis. He is also the resident temple medium, which devotees come to seek his help to overcome ill luck or change their fortunes for the better. Even the gods are sharing this empty space. 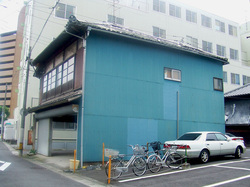 The street corner is shared with a shrine and porcelain deity/shrine donation/collection center. 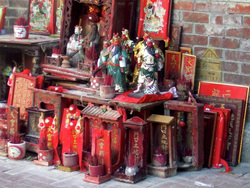 Individuals or families bring their shrines/deities here for donation and adoption. 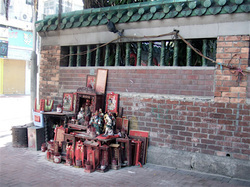 An interesting feature of the urban landscape of Asia is the occasional sprinkling of abandoned Chinese religious shrines lying next to a tree, along a discreet part of a public space, in the back lanes of houses and at road junctions. These shrines and deities are brought here to be donated when previous owners relocate to another home. 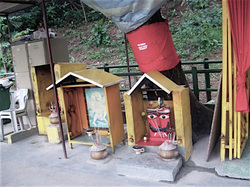 On the other hand, some make-shift shrines are erected by individuals and groups to express their gratitude for a prayer answered and to ensure a harmonious environment. The sharing of the empty space below the fire escape staircase among a cobbler, a cardboard collector and a key cutter exemplifies the spirit of co-existence in the city. 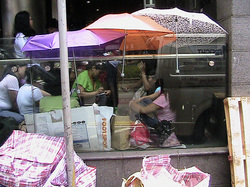 Every Sunday, lines of mobile plan vendors occupy the covered sidewalk in Hong Kong Island to peddle their business. Despite the competition among the vendors, the narrow strip of vacant space is generously shared among them. 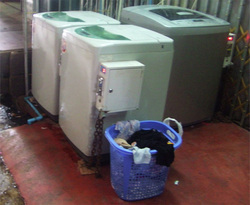 Instead of each household installing their own washing machines, three coin operated machines are placed at the corner of a empty sidewalk in Bangkok that residents can use daily. 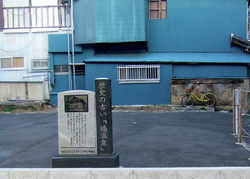 A retired resident of Beppu installed a series of memory markers in sites where historically significant buildings used to sit. The markers serve as physical, shared records of the city's collective history and provide a sense of cultural continuity for the younger generation. Residents in a public housing block in Singapore share the relatively quiet and empty public sidewalk and transform it into an extended outdoor living space. To borrow is to take possession momentarily with the promise of return at a future date, which can be a few hours, months or even years. The act is based on either an explicit or tacit agreement between the lender and the borrower. Sometimes, the borrower has to undertake additional tasks in order to continue the act of borrowing. This is especially important if the time frame is an extended one. In Japanese landscape design, the strategy of borrowing a view to visually extend the limited space of the garden gathers and configures the surrounding context into a unified composition and experience. 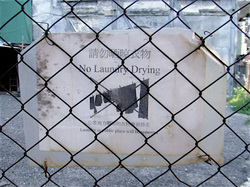 The fence erected around an empty site is borrowed by the local residents for laundry drying until it was stopped by the local authorities. A group of martial arts dancer borrowed the empty space below a staircase leading to an overhead bridge for their daily dance and exercise routines. 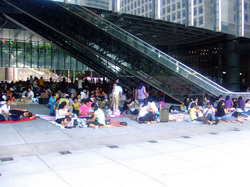 Migrant workers from the Philippines borrowing empty public infrastructures such as the elevated pedestrian bridge in Hong Kong Island as informal, social spaces on Sundays. 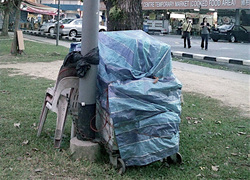 Public infrastructures like lamp posts are commonly borrowed as overnight storage spaces by street vendors in Singapore. By simply chaining the items and covering them over with a vinyl sheet, they are able to find free storage spaces in the city. 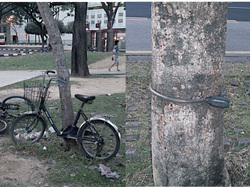 Besides public lamp posts, trees are also re-appropriated as places to park and lock up bicycles. When one person was asked the reason, he mentioned the tree is a good spot for ease of finding his bicycle while the canopy of leaves above offer some shade from the afternoon sun, which the purposeful built bicycle stands do not provide. 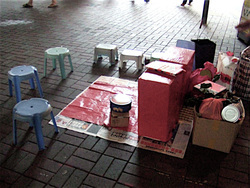 The entrance to a closed bank in Hong Kong was borrowed over the weekend by the elderly to set up his stall. The activity enabled him to make some extra money without the need to pay rent and utilities. As the entrance was raised from the sidewalk, it gave him visibility without obstructing the flow of pedestrians. 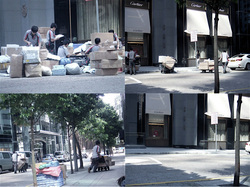 A group of couriers in Hong Kong borrowed two empty parking spaces to sort out the parcels, which were then grouped into different piles and placed along the sidewalks for delivery to the offices nearby. 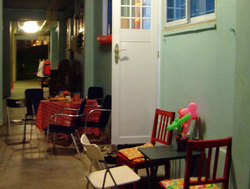 The empty sidewalk in the evening becomes a place for residents to meet and sing in public, giving the dull and dimly lit space a festive atmosphere momentarily. 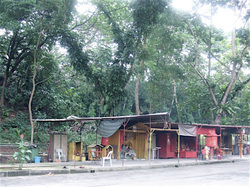 A boxing school and a motorcycle taxi stand borrowed the empty space below a highway to set up their activities. 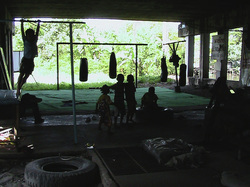 The boxing school was added by employees of the taxi stand to offer free Thai boxing lessons to the children who lived nearby. 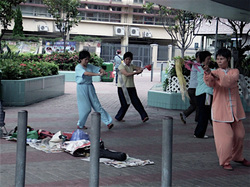 The school also enabled the employees who are not engaged in their work to pass their time in this sporting activity. The school is very popular with the local children who also see this as an open play space, away from their homes. 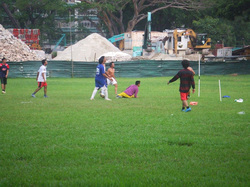 Migrant workers from the nearby construction site borrowed a empty piece of land in Singapore to play football on weekends. 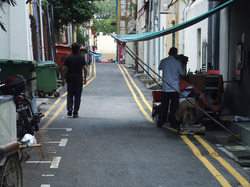 The back alleys of old shophouses in Singapore were used in the past to collect refuse and human excrement. With the arrival of modern sanitation in the city-state, the back alleys have lost their original purposes. The use of the back alley as a barbershop came about when the barber could no longer pay for the high rent for his former premise. He sought and obtained a license to operate as a street hawker, which enabled him to continue his trade and serve his longstanding customers. (7) The informal nature of the barber’s existence, despite having an official license, makes it a challenging experience as he is borrowing the space and needs to be vigilant against any actions that will jeopardize his continuing existence. The use of a building will be challenged by continuous re-programming at an ever greater pace than before as the fortunes of the owner or developer rise and fall with the economy. Moreover, if one were to conceive of the city within a 24hr cycle, then the potential to multiply the use of a space becomes a real possibility, which urban dwellers in the examples below bare testament to. Whether they borrow, adapt or share an existing space for their own use, it is inevitably re-programmed, and at times transformed beyond what the architect or owner had originally intended. Faced with this situation, city officials and building owners can either enforce rules to prevent such informal uses from taking place or look at this as an opportunity to respond swiftly to changing business conditions, and to support a more inclusive use of spaces. 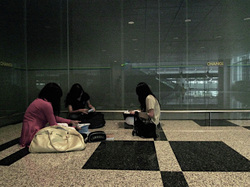 The Changi Airport in Singapore is a popular place for students to study during exam time and to socialize on weekends. Given its proximity to the city and the availability of safe and efficient public transportation servicing the airport, students gather at secluded corners and the coffee shops to study in the evenings or find a space where they can socialize in groups. 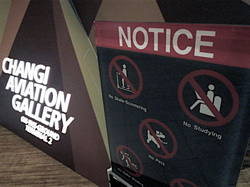 This has prompted the owners of the coffee shops to put up signs discouraging students from studying as they take up the seats meant for the customers. However, with resourcefulness and ingenuity, the students still have the upper hand and continue to use the airport for purposes other than what it was intended for. 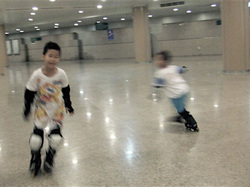 Children reclaimed the huge subway station in Singapore to practice their rollerblading skills. It is not uncommon for families and teenagers to use the empty space on weekends as it is air-conditioned, safe and away from the crowds. Due to the need to respond to changing business conditions with nimbleness and speed, several lower end shopping malls are providing 'no-frills' interiors that are rented out for short periods of time. These rapid re-programmable space can potentially give rise to an aesthetic of emptiness and offer a counterpoint to the over-aestheticized interiors. Unbuilding is the gradual erasure from something to nothing; the necessary ‘other’ of building and a creative act within the cycle of creation and destruction. With cities declining and buildings becoming obsolete sooner than before, the process of unbuilding, which opens up new spaces for different opportunities and engender the emergence of an alternative practice will necessarily become part of what an architect does. If demolition and destruction are akin to fast food, then unbuilding is slow food; a careful and delicate process of disassembling, cataloging, re-purposing and erasing of the existing building. Furthermore, the process of unbuilding as in deliberately making something absent though time also overturns our accepted role of the architect as a creator though design and accumulation. Perhaps architects can look at de-sign as an extension of their service to society since ultimately, unbuilding and building co-exist as two sides of the same coin. The Ise Shrine is a well-known Shinto site that is disassembled and rebuilt every twenty years. 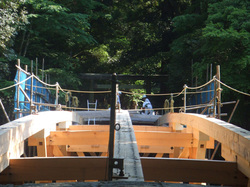 Contrary to our accepted wisdom of architecture preservation and buildings as cultural artifices that will bear witness to the course of human history through its enduring presence, the ephemeral nature of the Ise Shrine serves the same role in the opposite manner- through the process of unbuilding and rebuilding. Besides the significance of spiritual renewal in Shinto belief, unbuilding becomes necessary for more practical reasons as speculated by Svend M. Hvass’s book Ise: Japan’s Ise Shrine, Ancient Yet New. (8) The twenty-year span would be a limit to how long the timber beams, columns and thatched roof can last. Within the lifespan of a person, the twenty-year cycle permits the older generation of carpenters to pass down valuable knowledge to the younger ones in the process of re-building. If the shrines had persisted without unbuilding, these older craftsmen would have passed on, together with their construction wisdoms. 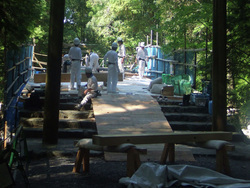 The timbers from the dismantled shrine are re-used for different elements within the shrine compound, such as the vertical poles of the Torii gateways and as replacement timbers for the less important shrines. Other remaining timbers are distributed to shrines throughout the country for the same purpose. The thatch roof, which is not reusable is burnt while any metal elements are melted down and recycled. 8. Hvass, Svend M. (1999). 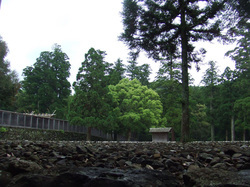 Ise: Japan’s Ise Shrine, Ancient Yet New. Copenhagen: Aristo Publishing. The slow economic decline of Beppu, Japan has resulted in many houses that are either completely abandoned, demolished or are deteriorating slowly with residents still living in them. The old traditional timber constructed houses were built close to each other, forming a dense network of narrow footpaths, small open spaces and residential units. Therefore, the removal of a neighboring house causes the compact organization to fall apart. Houses that remain standing are left without protection from the weather offered by the proximity of adjacent houses. The common practice is to use the easily available and cheap blue metal corrugated sheets to cover the ‘open face’ of the still standing house. 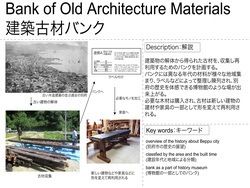 Two interdependent projects by architect Kenta Kishi, titled The Building Dismantling School and The Materials Bank proposed bottoms-up strategies of creating jobs, recycling materials and re-programming the vacant buildings for new uses. 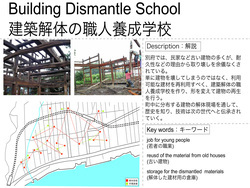 The Building Dismantling School, in particular focuses on the unconventional training of skills needed for the careful unbuilding of abandoned houses that cannot be re-used. The Materials Bank, on the other hand, provides a dedicated space in the city where salvaged recyclable building materials can be stored, given away or for exchange.